Brahmi - is a herb native to India. Perhaps it is the most important and powerful rejuvenator in Ayurvedic medicine. Brahmi means “the cognition of Supreme Reality” in Sanskrit. Brahmi is a plant commonly known as Water hyssop. Its botanical name is Bacopa monnieri . Brahmi is mild brain tonic. Improves capillary circulation, enhances concentration. Is the primary remedy to stimulate and strengthen nervous and brain cells. Brahmi improves intelligence, enhances memory, slows down the aging, increases life expectancy and provides strength to old people. Strengthens the immune system, by cleansing and nourishing it, as well as improves the function of the adrenal glands. It is also a strong blood-purifying agent and has a specific action in treatment of the chronic skin diseases. Among the plants is the most Sattvic (the one which gives the light), and the most spiritual plant in its essence. Brahmi is widespread in Himalaya and used by yogis in their diet due to its ability to promote meditation. Brahmi is recommended for everybody who wants to promote and improve mental clarity. Brahmi is used in the Rasayana (rejuvenation) and promotes Ojas (vital energy). The whole herb is used for preparation of Brahmi supplement due to its high content of alkaloids such as brahmine, herperstine, monnierasides and saponins. Has a rejuvenating, antipyretic, diuretic effects, also it strengthens the nervous system. Used to improve memory, treat epilepsy, insomnia, and as a mild sedative agent. It improves cognitive function and memory. It promotes cortisol metabolism. Brahmi is an effective treatment for gastric distress and allergic reactions. Produces a positive effect on the liver, by calming "fiery" emotions, which mostly contribute to liver disease. Regular use of Brahmi helps to control tendency to overeat; that is why it is useful for treatment of overweight and obesity. Brahmi is also helpful for the treatment of the opposite eating disorder – emaciation caused by anorexia nervosa (aversion to food). Brahmi is used to treat bronchitis with fever due to its ability to mildly stop cough. It gives positive results in the treatment of heart disorders and hypertension. Brahmi is prescribed to treat nose bleeding, accompanied by such symptoms as feeling of heat, fever and red face. Brahmi has an effect of cleansing the genito-urinary system. It is recommended for STD treatment. Brahmi provides good results in treatment of craniocerebral injuries and surgeries due to its property to relieve stress and heal nervous tissue. Brahmi is used in a complex treatment of tobacco, alcohol and drug addictions acting on the mental level. It is recommended for treatment of alcoholic encephalopathy. Sattva Brahmi is recommended to children, especially hyperactive. It calms down mind and emotions and purifies blood. The usage of Brahmi in elderly shows amazing results restoring memory and renewal of brain cells. It is the best remedy to improve hearing. Promotes the development of intelligence and improves the memory. Has sedative effect and used in insomnia treatment. Affects positively the liver function. Effective obesity and anorexia treatment. Used for complex treatment of cardiac disorders and hypertension. Eliminates tinnitus and improves hearing. Recommended for old people; restores memory. 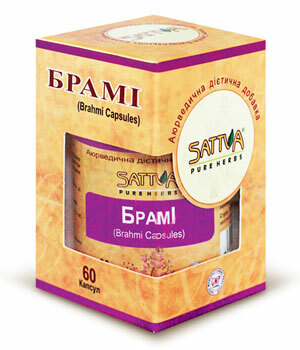 People after 50 years old should take Sattva Brahmi capsules as 50 days course once a year. It helps to restore memory function and increases mental activity. Brahmi extract (Whater Hyssop - Bacopa monnieri). Nervous disorders, headaches, intense mental stress, failing memory, nervous origin seizures, epilepsy, tinnitus, hypertension, bronchitis, gastrointestinal disorders, obesity, anorexia.